7 different marking options for the Skunkmodel Works MQ-9 Reaper kit, including multiple USAF units, Royal Air Force and "Ikhana", an unarmed Reaper being used by NASA. 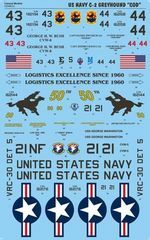 Three different US Navy marking options for the Kinetic S-2E/G Tracker kit: VS-21, VS-22 and VS-29. 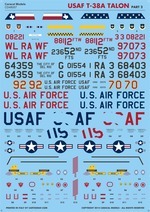 10 different US Air National Guard options for Monogram/Trumpeter F-100 kits. 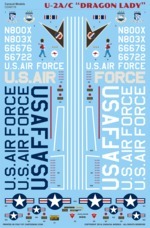 Markings for New Mexico, New Jersey and District of Columbia Air National Guard F-100C/F Super Sabres. 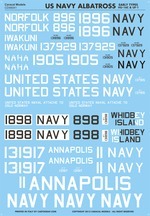 10 different marking options for various S-2 versions from seven different colors. 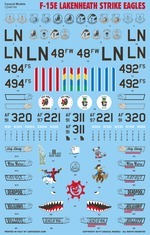 This best-selling sheet has very colorful markings for Canadian, Dutch, Japanese, South Korean, Thai, Taiwanese and Turkish S-2 Trackers. 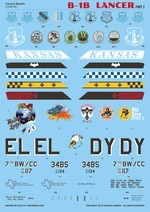 22 very colorful options for Turkish Air Force F-16C/Ds from seven different squadrons. 18 new options for Turkish Air Force F-16C/Ds from six squadrons not covered in the first set. 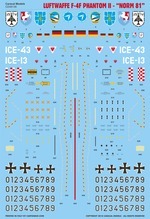 Four foreign marking options (Canada,Greece,Iraq,Morocco) for the new Ibex 1/48 T-6 Texan II kit. CD 48009: Texas ANG 149th FW F-16C "Lone Star Gunfighters"
Special 65th anniversary markings for San Antonio-based 149th Fighter Wing F-16C. Three (Maine, Oregon and Washington ANG) US Air National Guard marking options for F-101B/F Voodoo. Three options for Israeli-upgraded F-4E/2020 Phantoms of the Turkish Air Force from all three operator squadrons. 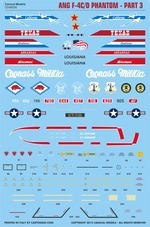 New US Navy markings for the Kinetic C-2A Greyhound kit in 1/48 scale. Four (Texas, Pennsylvania, Hawaii and Idaho ANG) US Air National Guard marking options for the F-102A Delta Dagger. 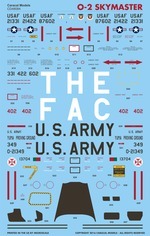 The Texas ANG markings are for 111 FIS (former president George W. Bush's unit). 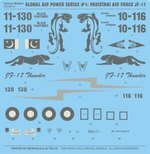 The first sheet in our "Global Air Power" series covering lesser known air forces, this sheet provides two operational Pakistani Air Force marking options for the Chinese/Pakistani JF-17 "Thunder" fighter aircraft. 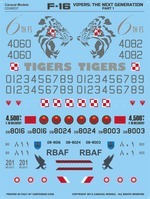 This decal sheet provides seven marking options for the new Kinetic 1/48 F-5A kit, including a USAF "Skoshi Tiger" example from the Vietnam War, complete with mission markings. 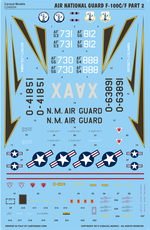 Four marking options for 1980s Air National Guard T-33s (Florida, Massachusetts, Michigan and Pennsylvania ANG). 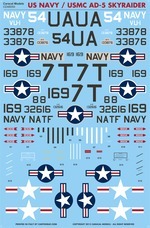 Multiple marking options for the new F-94C kit from Kitty Hawk. 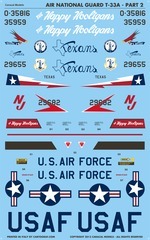 Four marking options for 1980s Air National Guard T-33s (New Jersey, North Dakota, Oregon and Texas ANG). One option each for North Korean (DPRK) and Iranian (IRIAF) Mig-29 Fulcrum multirole fighter. 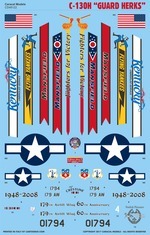 Post-WWII ANG P-51D markings for Kentucky and Texas Air National Guard. 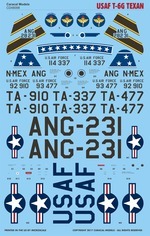 Current ANG F-15C markings for 142 FW (Oregon ANG) and 120 FW (Montana ANG). 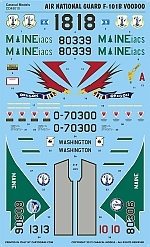 Current ANG F-15C markings for 173 FW (Oregon ANG) and 104 FW (Massachusetts ANG). 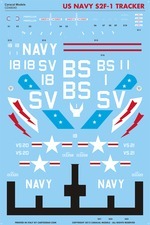 Two US Navy T-45C Goshawk markings options (VX-23 and VT-21) for the new Kinetic kit. 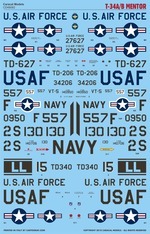 Four US Navy T-45C Goshawk markings options (TW-1 and VT-7 commander's aircraft, VT-1 and VT-86) for the new Kinetic kit. Two US Navy T-45C Goshawk markings options (TW-1 reserve component and VT-9 commander's aircraft, VT-1 and VT-86) for the new Kinetic kit. 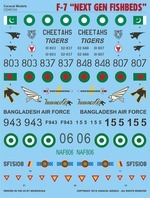 Colorful marking options for MiG-29s from Bangladesh, Bulgaria, India, Myanmar and Romania. 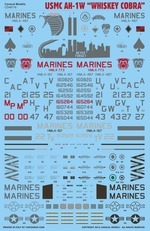 Multiple marking options for early Harriers of US Marine Corps. 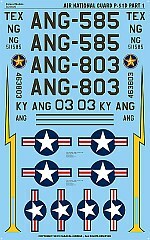 Current ANG A-10C markings for Idaho ANG(190FS) and Indiana ANG(163FS). 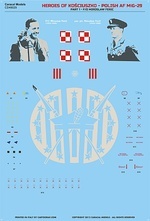 This decal sheet provides markings for Polish Air Force MiG-29 that was specially decorated to commemorate Polish WWII hero F/O Miroslaw Feric. 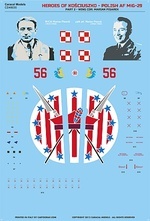 This decal sheet provides markings for Polish Air Force MiG-29 that was specially decorated to commemorate Polish WWII hero Wing Cdr Marian Pisarek. Two US Navy (HT-8 and VC-1) and one US Air Force (HH-34J) option for the Sikorsky S-58(H-34) family of helicopters. 10 different options for USAF T-38 trainers, companion trainers & adversary aircraft. Designed for the new Wolfpack kit. Seven marking options for A-6A and early A-6E Intruders; including four Vietnam War aircraft. 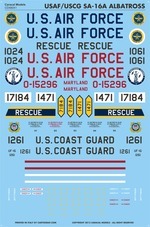 Units featured are VA-35, VA-42, VA-65, VA-165, VA-196 and VMFA(AW)-242. Current ANG A-10C markings for Arkansas ANG(188FW) and Michigan ANG(127FW). 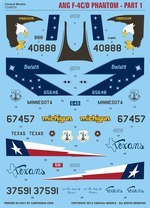 New ANG Phantom markings for Oregon (114 FIS), Texas (111 FIS), Michigan (171 FIS F-4D) and Minnesota (179 FIS) ANG units. Sized for the new Academy kit. 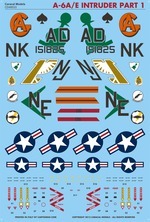 New ANG Phantom markings for Michigan (171 FIS F-4C), Hawaii (199 FIS), Oregon (123 FIS) and North Dakota (178 FIS) ANG units. Sized for the new Academy kit. 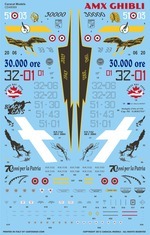 F-16C/D markings for Poland (Tiger Meet 2011), Morocco, Bahrain and Oman. New camouflaged ANG Phantom markings for Arkansas, Indiana, Louisiana, Missouri, and Texas ANG units. Sized for the new Academy kit. 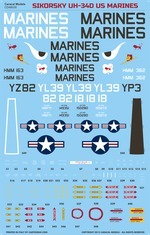 US Marine Corps UH-34D markings from the Vietnam War period. 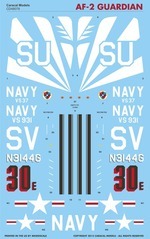 US Navy markings for early (short fuselage) S-2 Trackers in overall Gloss Sea Blue. 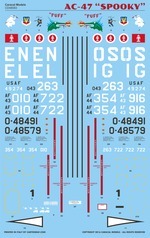 Six colorful options for early (HU-16C & UF-1) Navy Albatrosses, designed for the new Trumpeter kit. Three US Navy options (VAH-1, VAH-5 & VAH-6) for the A3D-2 Skywarrior bomber, designed for the new Trumpeter kit. 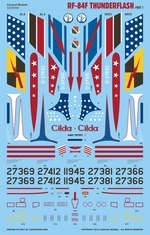 Multiple options for the French Air Force aerobatics team "Patrouille de France", including every special commemorative marking worn by the team since 1995. 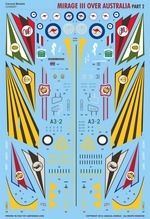 Designed for the new Kinetic 1/48 Alpha Jet kit. 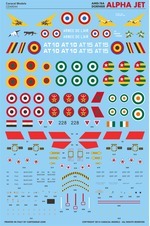 Alpha Jet markings for France (7 options), Belgium (2 options), Cameroon, Egypt, Ivory Coast, Morocco, Nigeria and Togo. 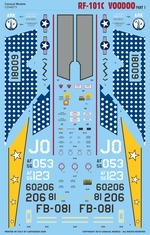 Designed for the new Kinetic 1/48 Alpha Jet kit. Seven US Navy options (VAH-4, VAH-10, VAH-11 and VAQ-308) for the A-3B / KA-3B Skywarrior bomber. Designed for the new Trumpeter kit. 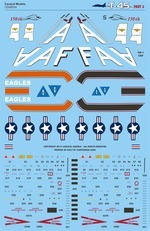 Seven USAF and two VNAF marking options from the Vietnam War period. 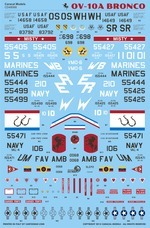 Designed for the recently released Revell A-1E kit. 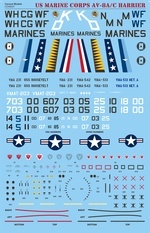 Our second sheet for the Trumpeter SA-16A kit features markings for USAF, US Coast Guard and Air National Guard aircraft. 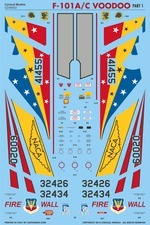 Accurate markings for both YF-23 prototypes, designed for the new Hobby Boss kit. 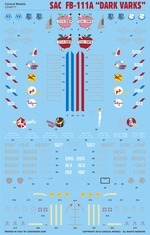 Multiple options for F-35A/B Lightning II for all current operators (USAF, USMC and UK). 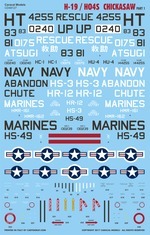 Multiple Navy and Marines options for the AD-5 "fat face" Skyraider. 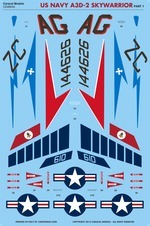 Designed for the recently released Revell A-1E kit. 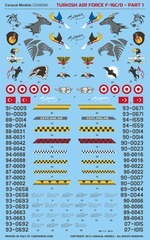 Markings for T-38A Talons of Turkish (4 options) and Portuguese (3 options) Air Forces. Designed for the Wolfpack kit. 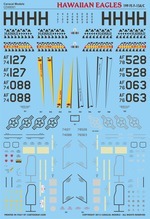 Multiple marking options for the F-101A/C Voodoo. 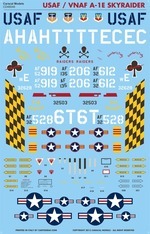 Designed for the upcoming Kitty Hawk kit. 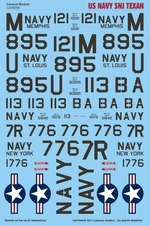 Nine US Navy marking options for the SH-2F Seasprite (HSL-30/31/32/33/34/35/36/74/84). 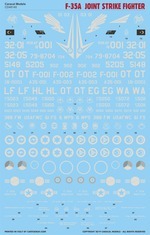 Designed for the new Kitty Hawk kit. 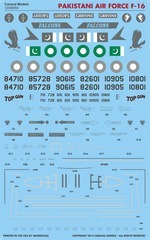 Accurate markings for all F-16 variants operated by the Pakistani Air Force, complete with unit markings and nose art. 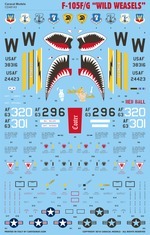 Markings for the 2013-2014 special markings of the 482FW "Makos" flagship F-16C. Markings for camouflaged F-16 Vipers involved in the CAS (close air support) evaluation program. 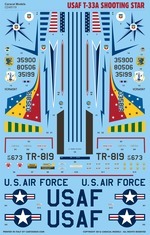 Nine options for USAF T-38A Talons from the 1970s and 80s; including two in aggressor camouflage. 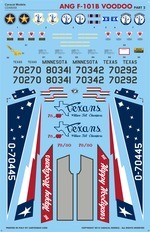 Markings for ANG F-101Bs from Texas, Minnesota and North Dakota. 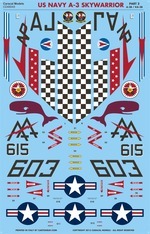 Markings for the iconic Cold War supersonic bomber B-58. Designed for the Monogram (Revell) kit. 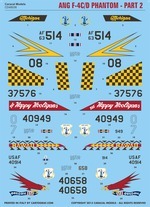 Markings for Florida, Massachusetts, and Montana ANG F-106A/B Delta Darts. 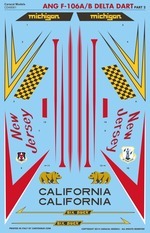 Markings for California, Michigan, and New Jersey ANG F-106A/B Delta Darts. 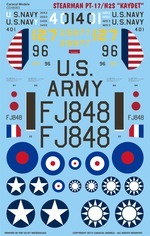 Markings for civilian F-104 Starfighters operated by Starfighters Aerospace. 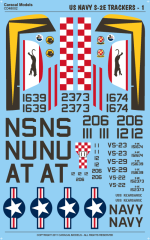 Multiple marking options for Stearman PT-17/N2S Kaydet WWII-era trainers. 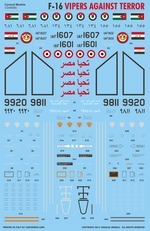 Designed for the new Revell kit. 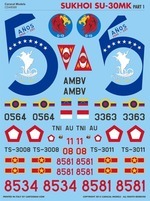 First sheet in a series of two which will cover the service of the "Hun" in Vietnam. 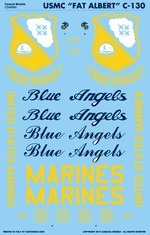 Markings for the specially decorated C-130T logistics aircraft attached to the Blue Angels aerobatic team. CD 48066: EMB-314 Super Tucano : "Esquadrilha da Fumaca"
Markings for the colorful Brazilian Air Force aerobatics team Esquadrilha da Fumaca ("Smoke Squadron"). Designed for the new Hobby Boss kit. 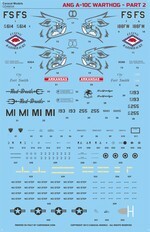 A comprehensive decal sheet covering the Mirage IIIO in Royal Australian Air Force service. Designed for the new Kinetic kit. Multiple options for the legendary OV-10A Bronco. Seven marking options for Italian Air Force AMX / AMX-ACOL "Ghibli" light attack aircraft. 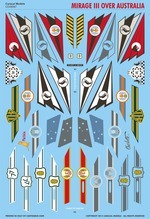 Designed for the upcoming Kinetic kit. 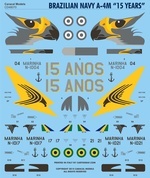 CD 48070: Brazilian Navy AF-1 (A-4M) Skyhawk "15 Years"
Markings for the spectacular special scheme to commemorate the 15th anniversary of Brazilian Navy's A-4M Skyhawk operations. 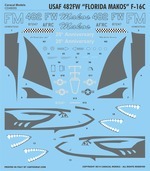 Designed for the Hasegawa kit. 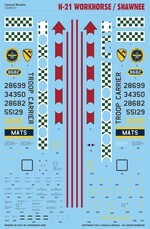 Markings for Royal Saudi Air Force Tornado in desert camouflage and the new gray scheme. Designed for the new Revell kit. 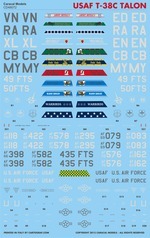 Multiple marking options for current USAF T-38C trainers. Designed for the new Wolfpack kit. Multiple marking options for USAF RF-101C Voodoo photo reconaissance aircraft. 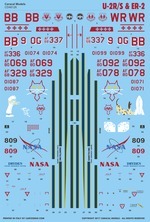 Designed for the upcoming Kitty Hawk kit. 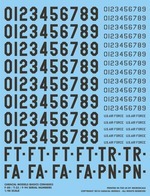 Multiple marking options for various types (F-4D,F-4E,F-16) that were based at the Bergstrom Air Force Base near Austin, TX over the years. 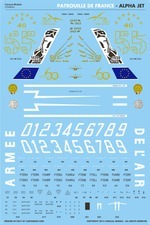 Multiple marking options for Mirage IIIE/D/R from various nations. Designed for the upcoming Kinetic kit. Six marking options for US Navy and USAF C-45 Expeditor light transport aircraft. Designed for the ICM kit. Eight marking options for the MQ-9 Reaper unmanned aerial vehicle, including ROyal Air Force, French and Italian Air Force aircraft in addition to several USAF examples. Multiple options for 1950's US ASW hunter/killer aircraft AF-2 Guardian. Designed for the MPM kits. Multiple marking options (Royal Canadian Air Force, RAF, Japanese Maritime Self Defense Force and Air America) for C-45 Expeditor light transport aircraft. 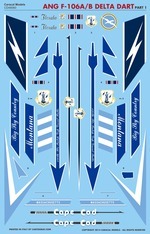 Designed for the upcoming ICM kit. 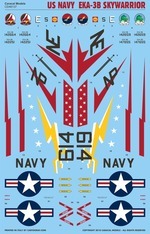 Markings for F-15C/D Eagles of the USAF 493 FS "Grim Reapers" based at RAF Lakenheath, UK. 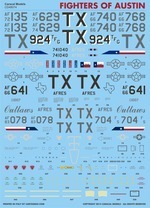 Multiple marking options (USAF, New Zealand, Canada and Mexico) for the Ibex 1/48 T-6 Texan II kit. Multiple marking options for the T-34A/B basic trainer. Designed for the upcoming Minicraft. Multiple marking options for AC-47 "Spooky" gunship. Multiple marking options for the O-2 Skymaster utility aircraft. CD 48085: F-16 "Vipers Against Terror"
Multiple marking options for Egyptian, Jordanian and Iraqi F-16s that took part in anti-terror operations over Syria and Iraq. Marking options for Japanese (JASDF, JMSDF and JGSDF), Turkish and Canadian T-34A Mentors. Designed for the upcoming Minicraft kit. 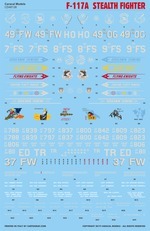 Multiple marking options for the F7F Tigercat twin-engine fighter. Markings for Sukhoi Su-30MK/MKK fighter-bomber from Venezuela, Indonesia and Vietnamese air forces. 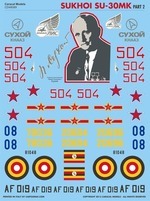 Markings for Sukhoi Su-30MK/MKK fighter-bomber from Russia (KnAAPO test aircraft), China and Uganda. 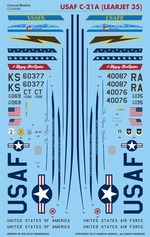 Markings for Hawaiian Air National Guard (199 FS) F-15A/C Eagles. 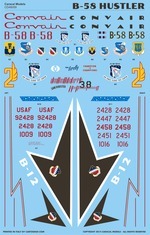 Markings for current USAF B-1B Lancer bombers from various units. CD 48093: USAF F-16C "Dark Vipers"
A selection of current USAF F-16C markings in the new, overall dark gray Have Glass V paint scheme. 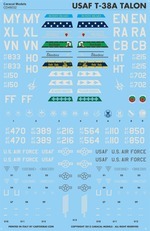 Markings for RF-84F Thunderflash photo-reconnaissance jet, designed for the Tanmodel kit. A comprehensive set covering the F-4E (and F-4E/2020) in Turkish Air Force service, since the late 1990s to current day. Markings for six USAF C-21A transport aircraft, a militarized version of the Learjet 35. 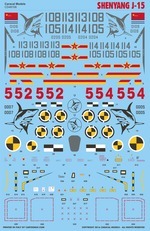 Designed for the Hasegawa Learjet 35 kit. 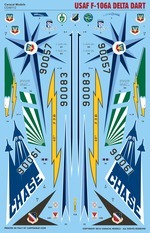 More RAAF MIrage III markings, featuring markings for units not covered in our very popular first set. Four USAF / ANG T-6G Texan options from the 1950-1960s. Four US Navy SNJ (T-6) Texan options from the 1950-1960s. 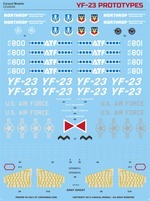 A comprehensive set for USAF and NASA SR-71 & YF-12 markings. Multiple options of USAF F-104C Starfighters that participated in the Vietnam War. 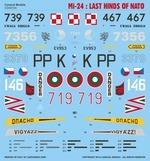 CD 48104: Mi-24 "Last Hinds of NATO"
Markings for colorful prototype JL-9 / FTC-2000 fighter trainers. Designed for the Trumpeter kit. 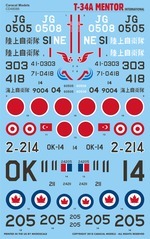 Markings for prototype and operational Chinese Navy (People's Liberation Army Naval Air Force) J-15 carrier-based fighter/bombers. Designed for the new Kinetic kit. 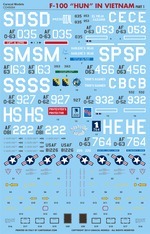 Multiple marking options for DHC-2 Beaver utility aircraft in USAF, US Army and British Army service. 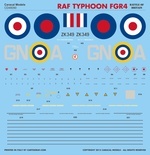 Markings for Royal Canadian Air Force CT-155 and Royal Australian Air Force BAe Hawk Mk.127 jet trainers. 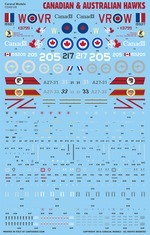 Includes markings for RCAF 419 Sqn commemorative "Lancaster KB799" scheme. Multiple marking options for J2F Duck amphibian. CD 48111: FB-111A "Dark Varks"
Multiple USAF marking options for the SAC FB-111A swing-wing strategic bomber in the "Dark Vark" scheme. 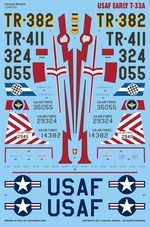 Four markings options for USAF F-106A Delta Darts. 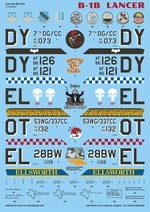 Markings for post-WWII ANG P-51D units from Wyoming, Tennessee and Pennsylvania ANG. Five marking options for USMC AV-8B Harrier Plus jump-jets. 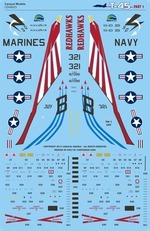 Nine marking options for AH-1W Super Cobras of US Marine Corps, including a 9/11 tribute special scheme. 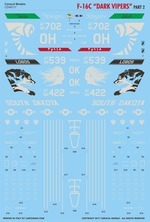 Options for USAF F-16s in the new Have Glass V scheme from three more USAF units (MN, OH and SD ANG). Five marking options for USAF T-33A jet trainers. Designed for the new Great Wall Hobby kit. 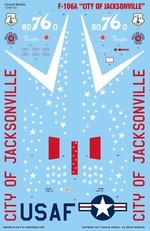 CD 48120: F-106A "City of Jacksonville"
Multiple marking options for the Piasecki H-21 Workhorse/Shawnee tandem rotor helicopter. CD 48122: USAF C-130H "Guard Herks"
Four marking options for C-130H Hercules tactical transport aircraft from different Air National Guard units, including the colorful Ohio ANG 60th anniversary scheme. Marking options for early (mostly 1950s) USAF T-33A Shooting Stars. Designed for the Great Wall Hobby kit. CD 48124: F-7M "Next Gen Fishbeds"
Multiple markings for the Chengdu J-7M "double-delta wing" Fishbeds. Multiple marking options for the EMB-312 turboprop trainer. Designed for the Hobby Boss kit. Multiple USAF markings for current generation U-2R/S (TR-1) spyplanes. 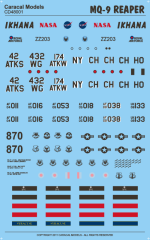 Six marking options for US Navy & US Marine Corps HRS-1/3 and HO4S helicopters. Designed for the Revell kit. 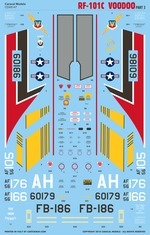 More marking options for Vietnam War F-100D Super Sabres. 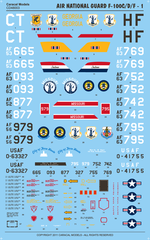 Multiple marking options for UH-1C/D Hueys from the Vietnam War. 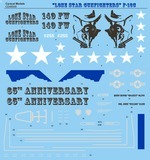 Two special anniversary schemes from South Dakota and Texas ANG F-16C units. USAF, US Army, US Coast Guard and Royal Navy marking options for H-19 and HO4S helicopters. Designed for the Revell kit. 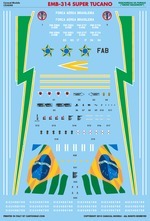 Three colorful marking options for Brazilian Air Force T-27 (EMB-312) Tucanos, including the 30th anniversary special scheme. Designed for the new Hobby Boss kit. CD 48133: EMB-312 Tucano "Esquadrilha da Fumaca"
Markings for EMB-312 Tucanos flown by the Brazilian Air Force aerobatics team Esquadrilha da Fumaca ("Smoke Squadron"). Designed for the Hobby Boss kit. Multiple USAF marking options for F-94A/B early jet fighters. Designed for the Hobbycraft kits. Part 1 of a comprehensive series covering the RAAF service of the "legacy" F/A-18 Hornet. Designed for the Kinetic kit. 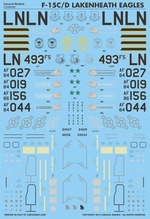 CD 48136: Luftwaffe F-4F Phantom II "Norm 81"
Markings for Luftwaffe F-4F Phantoms in the "Norm 81" camouflage scheme. Multiple US Navy options for the EKA-3B electronic warfare aircraft. Designed for the Trumpeter kit. Multiple USAF marking options for F-117 stealth fighters from the Desert Storm and later periods. 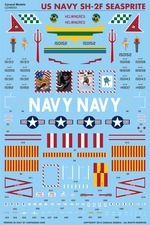 Designed for the Tamiya kit. Multiple USAF marking options for Vietnam and post-Vietnam era F-111A attack aircraft. Marking options for all F-35A Lightning II operators - US, Australia, Israel, Italy, Japan, South Korea, Netherlands, Norway and Turkey. Designed for the Meng kit. 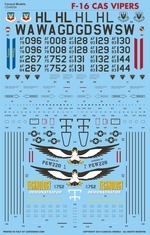 Marking options for all F-35B Lightning II operators - all USMC units flying the type, RAF and Italy. Designed for the Kitty Hawk kit. CD 48142: EF-111A "Spark Varks"
Multiple marking options for USAF EF-111A Raven electronic warfare aircraft. CD 48143: F-105F/G "Wild Weasels"
Ten marking options for USAF F-105F/G "Wild Weasel" SAM suppression aircraft from the Vietnam War period to the 1980s. More marking options for current USAF B-1B Lancer bombers from various units. 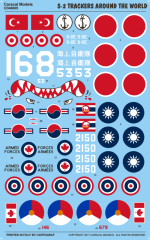 Multiple USAF marking options for F-86 Sabre jet fighters from the Korean War. 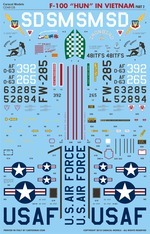 Multiple USAF marking options for F-82 Twin Mustang fighters. Six new marking options for USAF RF-101C Voodoo photo reconaissance aircraft. 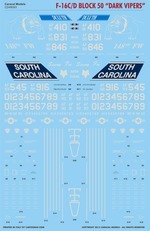 Designed for the Kitty Hawk kit. Multiple international marking options for CH-47 Chinook helicopters. Multiple marking options for Lakenheath-based F-15E Strike Eagles, including several with nose art. 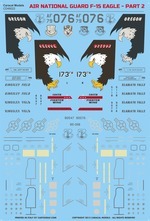 Multiple marking options for prototype and early USAF service F-15 Eagles. Multiple marking options for Mi-8MT/17 Hip general purpose helicopters. Designed for the Annetra kit. Multiple marking options Hawker Hunter jet fighter. Four marking options for the BN-2 utility aircraft. Designed for the Valom kit. Colorful marking options for the DHC-3 Otter utility aircraft. 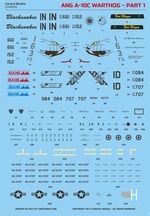 Multiple marking options for the JAS-39 Gripen. 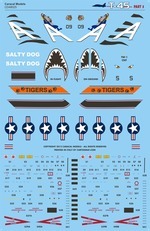 Designed for the Kitty Hawk kit. Multiple marking options for the Dassault Rafale. Designed for the Revell kit. 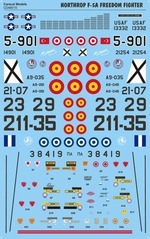 Three colorful marking options for the L-39 Albatros. Designed for the Trumpeter kit. Multiple marking options for prototype and test F-18 Hornets. 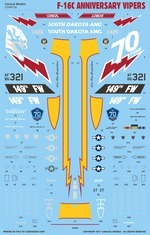 Multiple marking options for Air National Guard F-84F Thunderstreaks. Stencils and RAM intake markings for SAC FB-111A in the "Dark Vark" scheme. 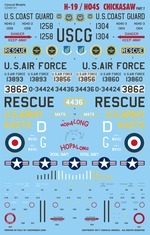 Accurate markings for F-86 buzz numbers. 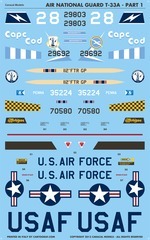 Accurate markings for buzz numbers in the style applied to various Lockheed-built aircraft in the 1950s, including F-80, T-33 and F-94 variants. 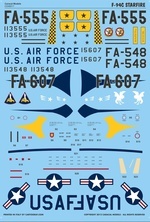 Accurate stencils & general insignia for USAF F-117 Nighthawks. 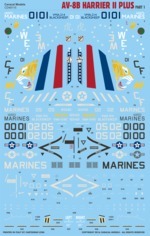 Accurate stencils for F-35A/B Lightning II. 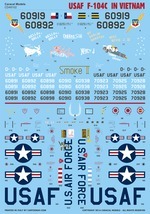 Accurate stencils & general insignia as applied to current USAF F-15E fleet.